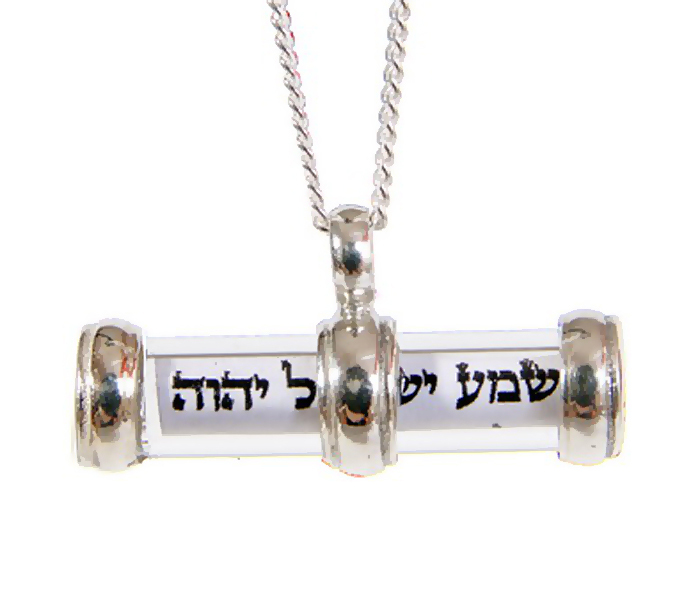 The Ten Commandments are enscribed on parchment within this horizontal bar pendant from Emunah Jewelry. The pendant is capped at either end and around the middle in sterling silver. This special bar pendant from Emunah Jewelry lets you wear the Ten Commandments as given to the children of Israel close to your heart with a touch of style. The Hebrew scriptures are inscribed on parchment within the hollow glass tub, which is suspended horizontally from a silver chain. The pendant is capped at either end in sterling silver, with a third band of sterling silver around the middle, where it attaches to a simple ring through which the necklace chain is threaded.Emunah Jewelry designs and produces all the pieces in its collection in a studio on Moshav Shoeva in the foothills of Jerusalem. Emunah strives to create Jewish jewelry that features original design and fine craftsmanship. Motifs focus on Jewish themes.All of Emunah's jewelry uses the best materials available - 925 sterling silver, 9/14/18 karat gold, pewter, and precious and semiprecious stones. Each piece is stamped with the company's ID to ensure quality and prevent imitations. All Emunah jewelry comes with a warrantee.